Boom. Big ‘ole picture of a spaghetti squash in your FACE! Although the name “spaghetti squash” may sound like the beginning of a Seinfeld bit (Is it spaghetti? Is it squash? You tell me?! ), it is actually a pretty great vegetable that is gaining popularity. If you are already a fan of the spaghetti squash then this post may seem kind of “duh doy” to you, but (despite it’s growing popularity) I’m always surprised at how many people still haven’t tried it. This post is for those people. 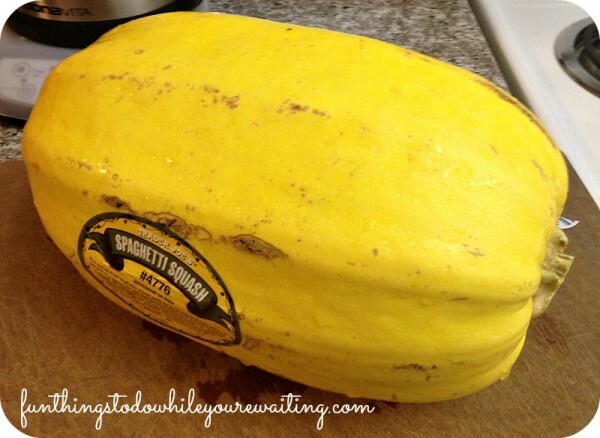 If you’ve ever walked by a spaghetti squash and wondered, “huh?”– then this post is for you. So, what is a spaghetti squash? It is definitely a squash. Like an acorn or butternut squash, the spaghetti squash is from the winter squash family– which means it has a hard rind and can be stored for use during the winter. When raw, spaghetti squash looks like normal raw squash. But when cooked? When cooked, the flesh of the squash falls away in ribbons. Half the fun of making this vegetable is scooping the ribbons/”spaghetti” out. Other names for this veggie (according to Wikipedia) are: vegetable spaghetti, noodle squash, vegetable marrow, spaghetti marrow, and squaghetti. All of which are hilarious. There are a ton of ways to cook a spaghetti squash– you can bake, boil, steam, and microwave them (and let me know if you’ve got the best microwave recipe) but baking has yielded by far the best results… for me. As much as I love spices and experimenting in the kitchen, sometimes simple is the right way to go. I’ll never forget– I had purchased some beautiful English peas at a farmers market and was researching the best way to prepare them. I went to my The New Best Recipe cookbook (which is kind of like the food bible) and was expecting a complex, intensive preparation like most of the other recipes in the book. Instead, the recipe read something like: boil peas, add butter, maybe salt and pepper. Sometimes the best thing to do to a vegetable is to let IT be the star instead of covering it with spices… especially when cooking the first time so that you can get a feel for the taste and texture. Spaghetti squash isn’t for everyone. But, not only is spaghetti squash an awesome side dish, as is, it can be used as a spaghetti noodle substitute. Although it visually looks like spaghetti, the texture and mouth feel are markedly different than pasta, natch. The recipe that introduced me to spaghetti squash (and the one I still use frequently) came from Emeril Lagasse and the Food Network. It’s a lovely, basic preparation, but a good foray into spaghetti squash lyfe. Preheat that oven to 375 degrees and get out your biggest, baddest knife. The hardest part of dealing with this vegetable is splitting it open. It takes some muscles and some swearing but persevere, for it is totally worth it. Once you have the squash split, don’t worry about the seeds and “innards”… we’ll deal with those later. Place the two pieces of squash face- down in a glass, baking dish (pic2). Add enough water to fill the dish halfway and then cover with aluminum foil and bake for 45 minutes. Like potatoes, you can tell when a spaghetti squash is done because it will pierce easily (pic3). The best tool when dealing with a spaghetti squash is your sturdiest barbeque fork (also pic3). Not only does it pierce the squash to show doneness, but it enables you to manipulate the squash easily in later steps. Pierce each piece of the spaghetti squash and flip them over. Recover them with foil and bake an additional 15 minutes. Remove from oven, uncover, and let it cool slightly. Once your squash has cooled enough, place a dish towel in your hand and fork a piece of cooked spaghetti squash over there. Once you are holding the squash half, you can easily scoop out the seeds of the squash with a spoon. Yes, you can scoop the seeds and guts before baking, but it is just so much easier afterwards. Once you have your seeds and innards scooped out, start heating a skillet with butter. The recipe calls for 2 1/2 tablespoons, but sometimes your squash will yield SO much “meat” that more butter is needed. Also, you can totally use any oils (grapeseed, olive, whatevs) instead of butter if that is your jam. The original recipe says to scoop the squash into a bowl, but (in my vigilant quest to avoid washing extra dishes) I simply scoop the meat of the squash directly into my skillet. Now here is where spaghetti squash gets interesting. Using a regular fork, gently pull the strands away from the rind and into the pan. Toss spaghetti squash and whatever herbs you have around (Emeril suggests using soft herbs–basil, chives, parsley, or sage) in the melted butter and then salt and pepper to taste. And that’s it! Like I mentioned earlier, the spaghetti squash world is your oyster… once you have the hang of dealing with it, then you can use it as a substitute for tons of things– not JUST spaghetti. Here’s a recipe I haven’t tried yet, but it uses spaghetti squash in lieu of crust for a quiche— doesn’t that sound divine? But, you can use sautéed garlic, or chicken broth when transferred to the skillet, it is such an improvisational star in the kitchen. And, get this, even Jojo likes it. 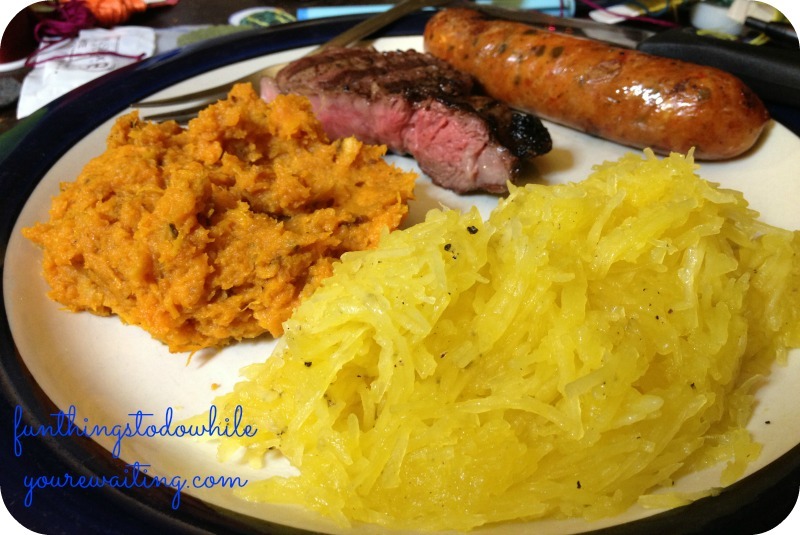 We used our spaghetti squash on a “clean out the larder” night… hence the half of steak and sausage. Ignore the mess behind the plate. I took this picture in the middle of my full-on Homemade Crimmus. But, how yummy does that squash look, right? I obviously encourage you to try it out! Not only is it yummy, but the stats are certainly better than real spaghetti. 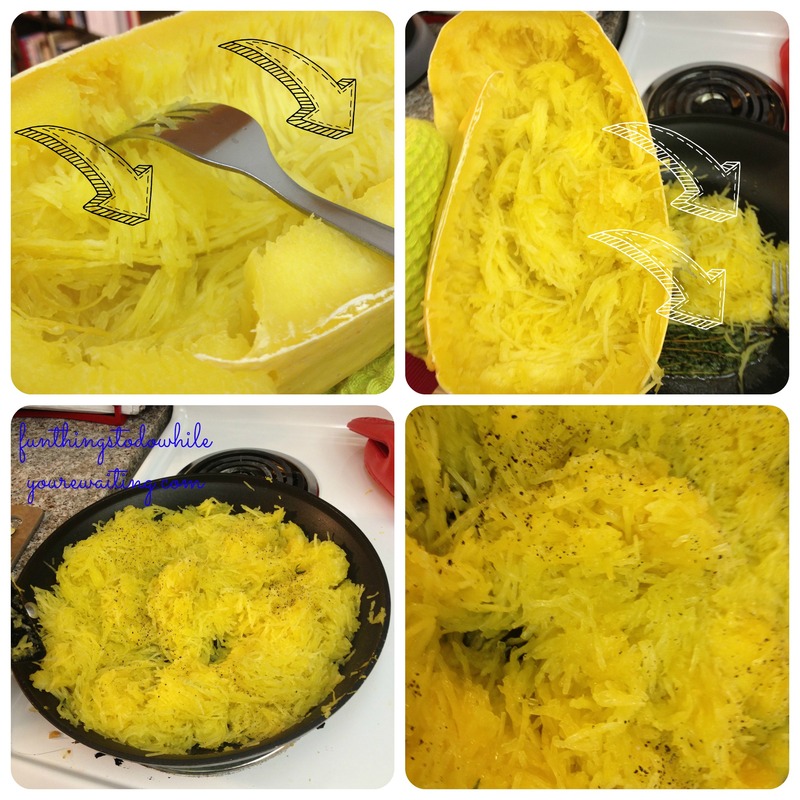 🙂 Do you have a magical spaghetti squash recipe? What do you think about it? As always, let us know! Using a sharp knife, cut the squash in half lengthwise and place cut side down in a baking dish. Add enough water to come ½-inch up the sides of the baking dish and cover with aluminum foil. Remove from oven, uncover, and allow to cool slightly. Moma’s Stuffed Squash! Summer (Veggie) Lovin’! Healthy Spaghetti, A New Take on an Oldie Squash Muffins… it’s a YES! 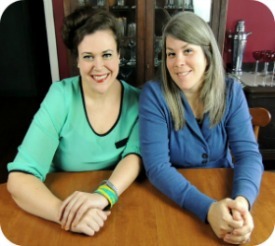 Cookbook Shoutout!, Healthy, Side Dishes, Uncategorized, What's Cookin'? 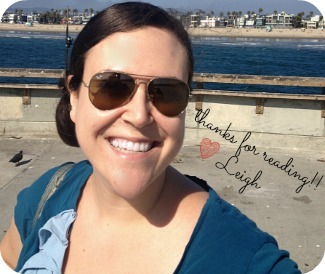 24DC, Cookbook Shoutout!, Healthy, Leigh, Side Dishes, What's Cookin'? I think we will give spaghetti squash another go! You made this look simple, easy and yummy!